Unlike most other sports, NASCAR begins each season with its biggest event of the year, the Daytona 500. 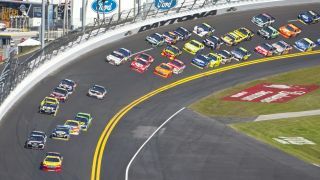 After 14 days of preliminary racing events as part of Daytona International Speedway’s 2019 Speedweeks event, 40 NASCAR drivers compete in the Daytona 500 - the Great American Race. Got you excited? We don't blame you. So here's all the information you need to get a Daytona 500 live stream. The 61st annual Daytona 500 will take place at the Daytona International Speedway in Daytona, Florida on Sunday, February 17. The three-hour plus race is scheduled to begin at 2.30pm ET / 11.30am PT. The Daytona 500 - now synonymous with the Presidents' Day weekend - is held on a 2.5-mile long track so the drivers need to complete 200 laps around the oval-shaped course to reach a total of 500 miles first in order to take home the $1million purse. Last year’s Daytona 500 was won by Austin Dillon who drove the Richard Childress #3 Chevrolet to a surprise victory after turning race leader Aric Almirola in the third corner of the final lap. William Bryon will start this year’s race first after taking pole position with a best lap time of 46.319 seconds. He will be followed by Alex Bowman who starts second after the qualifiers. So if you’re a NASCAR fan in the US or anywhere else in the world for that matter, we’ll show you how to watch a Dayton 500 live stream online so that you don’t miss a single lap of the Great American Race. NASCAR fans in the US have plenty of options to watch the Daytona 500 but the easiest way to do so is on your television. If you have a cable subscription or even an over-the-air digital antenna, you can watch the entire event on Fox. The network will begin its Daytona 500 coverage at 1pm ET / 10am PT and the race will begin an hour and a half later at 2.30pm local time or 11.30am PT. If you’d prefer to stream The Great American Race online, Fox has you covered with both the Fox Sports website and Fox Sports app showing live streams of the race. However, you will have to login using the credentials from your cable or satellite TV provider. Don’t fancy paying for a premium cable subscription to watch the Daytona 500? No need to worry as we have you covered with plenty of other ways to stream the race online. Keep reading to find out how. If you're outside the US this weekend and try to tune into one of the Daytona 500 live stream options as listed above, you're in for a disappointment as the coverage will inevitably be geo-blocked meaning you can't watch. At least, you wouldn't be able to but for the use of a VPN. A Virtual Private Network allows you to simulate your IP address to another location entirely. So you can fool your laptop or mobile into thinking it's somewhere else entirely - in this case, the US. Pretty clever, eh? If you live in Canada and have a cable subscription, then you’ll be able to watch the Daytona 500 on TSN. The network’s coverage will begin with the pre-race at 2pm ET (11am PT) followed by the actual race at 2.30pm ET (11.30am PT). If you’d prefer to live stream the Daytona 500 on your computer or mobile devices, you can do that as well using TSN Go. However, just like in the US, you will need to enter the login information from your cable provider to access the network’s stream. UK NASCAR fans can watch the Daytona 500 on subscription service Premier Sports with coverage of the race beginning at 7pm GMT this evening. There are a few subscription options available that vary depending on which platform you choose. Sky subscribers get the first month of Premier Sports FREE but then after that it costs either £9.99 a month or £99 each year. If you choose to sign up through Virgin Media, there is no free trial and the service costs £9.99 a month. Finally, if you choose Premier Sports’ own Premier Player the first month is free using the promo code FIRSTMONTHFREE and then the service costs £9.99 a month after that. And remember. If you're outside the UK this weekend but really want to catch that Premier Sports Daytona 500 live stream, then you'll need to install and download a VPN and watch as if back at home.